Boxelder bugs make homes in maple, ash, and box elder trees during warm months and will migrate into homes and buildings seeking shelter for the winter. They enter homes through small cracks and crevices on the exterior of a building and hibernate through fall and winter. Do not attempt to kill boxelder bugs that have already entered a home or building in wall voids because it can attract dermestid beetles. If they are squished they can leave a foul odor and stains on furniture and linens. As winter approaches, the bugs will congregate on the warmest exterior wall. This is where make their way through any cracks or crevices in your home’s exterior. Make sure you’ve sealed any obvious cracks in your foundation, and check for gaps around doors and windows. 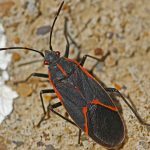 Warm weather or an increase in home heating during the winter may wake up the boxelder bugs by thinking Spring has arrived. This is when they enter the living area of the home in search for a way outside.